GermanThe exhaust gas scandal has a fundamental impact on the VW brand, which is also reflected in the product portfolio. In addition to the conventional models such as the VW T-Cross or the new VW Golf 8 Volkswagen puts on a whole armada of electric models. Group-wide there will be 70 electric cars in the next ten years. The pure electric models on the MEB kit will go for customers with a range of between 400 and 650 kilometers and a new look. They are based on the successful "burner" models. This is the VW ID. Neo the Golf, The ID. Crozz is the e-version of the Tiguan Coupe and the ID. Aero will come as an electric Passat in sedans and Variant form. Here are the most important in short letters. Volkswagen extends the Tiguan series and missed the compact SUV after the facelift for the "normal" Tiguan 2019 a coupe version. This is based on the Modular Transverse Toolbox (MQB). Compared to the Tiguan Coupe comes with a modified rear end and far into the tailgate reaching narrow lights. Numerous chrome finish is to give the SUV coupe a nobler appearance. The Tiguan Coupé is also positioned higher on the engines. Only the top engines from the Tiguan work here. There is the 2.0-liter twin-turbo diesel with 240 hp and the 220-hp 2.0-liter TSI. Both are paired with a 7-speed DSG. The digital cockpit and various assistance systems on board are also standard equipment. We estimate that the coupe from 42,000 euros for the gasoline and 45,000 euros for the diesel 2020 will roll to the dealers. With the 2019 model change, the new Golf will be visually more different from its predecessor, as was the case last. The designers want to achieve this with altered proportions (wider and flatter) and more distinctive details. The new VW Golf 8: For him VW invests 1.8 billion euros. In addition to the I.D. family, the new Golf generation is the most important series of the Wolfsburg. 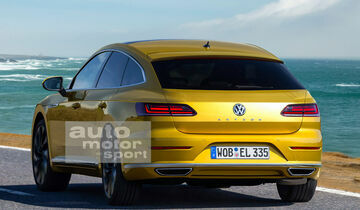 With model generation eight VW also wants to reduce the vehicle weight again by about 50 kilograms. Even the currently introduced in the Polo three-cylinder TDI should be ripe for the VW Golf until then. Further potential is offered by the cylinder deactivation ACT, which was previously only used in the 1.4 TSI, and above all by the alternative drives mentioned above. They can make the biggest contribution to CO2 reduction. From 2020, VW will shoot the Golf GTI and the Golf 8 Estate. This is flatter and lifestyliger from, the trunk volume is lower. 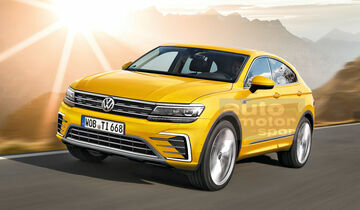 Volkswagen Group will launch a number of very important models from most of its brands this year. Some of them include the new Golf, a Cayenne Coupe, and a new Flying Spur, but there are also big premieres coming from Skoda and SEAT. The manufacturer’s core brand, Volkswagen, also has interesting new models in the pipeline and these could include a Tiguan Coupe and an Arteon Shooting Brake. The information is not officially confirmed by the automaker yet, but a new report from Germany’s Auto Motor und Sport claims we will see both new derivatives early next year. The Tiguan Coupe should arrive shortly after the facelift of VW’s popular compact SUV with a sloped roofline and more chrome accents for the exterior. Interestingly, AMS also says it will be positioned a bit higher than the regular Tiguan in terms of available engines, which means only the range-topping units will be offered. Basically, you'll be able to buy it with the 2.0-liter twin-turbo diesel with 240 horsepower (179 kilowatts) and the 220-hp (164-kW) 2.0-liter TSI gas unit. Both are paired with a seven-speed dual-clutch transmission. As far as the Arteon Shooting Brake is concerned, this one should follow the design philosophy of the Arteon sedan but offer more headroom for the rear passengers and significantly more boot volume. In order to make it a bit more special and upscale than the regular Arteon, AMS claims, Volkswagen is discussing a new VR6 powertrain for the stylish wagon with up to 400 hp (298 kW). Executives haven’t given the project the green light for production yet and we expect to hear more about it in the next few months. As a final note, the German publication briefly mentions a Tiguan R and Arteon R are also in the works for a 2020 launch. I typically don’t like the doggy hump style, but if this came with rear facing third row jump seats and Golf R power, it would be a compelling product. Unfortunately though the price it would command to even justify it on these shores would tickle Audi prices. Not many willing to drop $60k for a near mid size veedubb. Yeah... I'd kind of doubt that VWoA would bring it here... Too much overlap with Audi for corporate america. Which is sad, but probably the reality.